Exactly one year ago today, I made a post about my New Years Nerdolutions for 2014. I kind of made up the word Nerdolution to make the act of creating resolutions a little more exciting and relevant to this blog. Looking back on the resolutions I made last year, I only really achieved a few of them, while others became not so important to me. I think what is very important is to make priorities and try new experiences. One of my 2014 nerdolutions was to stream on Twitch. I did it several times in the past month, especially. I’ve learned that I absolutely hate live streaming! Even though I didn’t become an official live streamer live I wanted, I did learn that I didn’t want to do it anymore. Now that I’ve crossed something off the list, I can make way for something I actually enjoy doing. One of the few stated nerdolutions that I actually did was watch all of Doctor Who. I am so glad I did this and I love being part of the fandom. I’ve learned a lot from the show that inspires me in real life. A lot of what I’ve taken with me is from the seasons featuring the Eleventh Doctor. I also met my goal of going to conventions, but I didn’t get to cosplay. I still have my Poison Ivy costume…somewhere…if it didn’t get lost in the movie. I’m currently working on cosplay for Morrigan from Dragon Age. Last year I went to Lexington Toy and Comic Con and TriCon. This year I have plans to go to PAX South and who knows where else? As far as my nerdolutions for this year – my main goal is to prioritize. I’m the type who gets overwhelmed very easily. It’s also very important to me to try new things. I’ve already decided on what I don’t want to do, so it’s time to decide how I’m going to move forward. So, with streaming out of the way, I’ve decided that this year I’m going to stick with the blog and keep on writing. I would like to become a better writer. It’s okay if it doesn’t pan out to a career in writing. I just feel like this is something I can’t fail at if I give it a good try. I would also like to start making YouTube Let’s Play videos. I will let you all know when I make the first one and post it to the blog. For the TL;DR crowd, I’ve decided to not get worked up on making a ton of resolutions. I’ve quit some things that weren’t working for me to make room for new creative outlets. I’m going to keep up with the blog more often and work harder at writing. If any of you have some New Years Resolutions or Nerdolutions, be sure to post them in the comments. 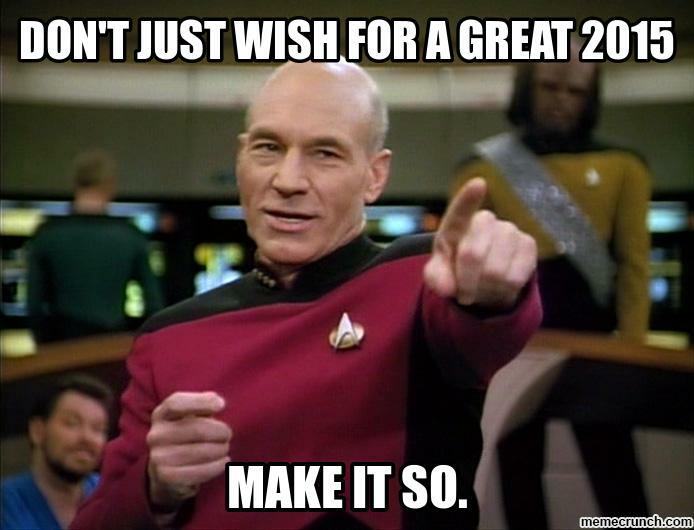 I’m sure everyone can use a little inspiration for making 2015 the best it can be. I know I can!